I was lucky enough to attend a signing last week at Midtown Comics, where Zachary Quinto signed Lucid, the new comic he produced through his company Before The Door. His co-producer Corey Moosa was also on hand for the signing. Lucid is written by Michael McMillian, also know as Rev. Steve Newlin from True Blood and the art is done by Anna Wieszczyk. Lucid follows Agent Matthew Dee, the mage newly appointed “Protector of the Realm,” to protect America from magical attacks. On his first mission, he gets embroiled in a plot to kill the president, who is believed to be the next King Arthur. As Dee continues down this path, his skill and faith are tested as his past secrets come back to haunt him. 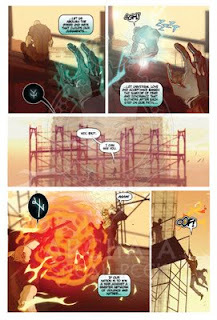 He has help from his mentor Edison, his mysterious girlfriend Ariah and British Necromage Agent Wren. This is a very big world that McMillian created and it can be hard to follow. One thing that helps is a guide to spells in the back of the book. Since each spell is shown as a sigil or mark, when reading it I had no idea what was going on. Once I found the handy guide, it was more interesting, even though it was tiresome to flip back and forth while reading. 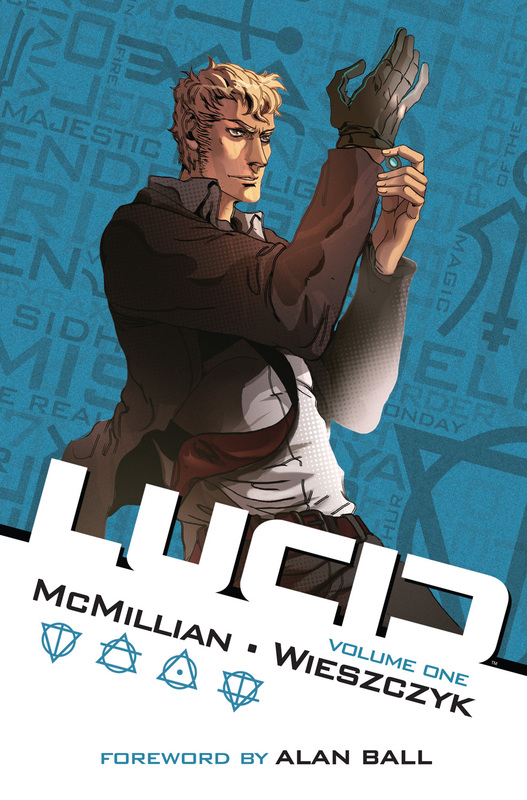 Not surprisingly, Lucid read like a TV pilot with all of the elements there. A sad backstory for the protaganist who has a new job, older mentor, distant girlfriend with a mystery, and a hot co-worker with some sexual tension. A lot of time is spent building Agent Dee's backstory while more magical explanations are ignored. Because of this, the story felt a bit rushed and confusing at times. Funnily enough, Lucid is listed on the Television page of Before the Door's ongoing projects. Despite this, Lucid is a very interesting concept and I look forward to a more in-depth look at this world. I think that he tried to cram a lot into this first story, which left too many elements half-explained. With a continuing series, he would have more time to expand upon the rules and characters of this world. However, I cannot find any indication that this will be more than the miniseries that it is. The art, I thought, was fantastic and really fit the story well. According to her bio on the flap, Wieszczyk is a student, which I just don't believe. I really enjoy her style and was thrilled to find her preliminary sketches in the back. I would recommend this to anyone who loves modern day magic tales. My only hope is that they continue the series to give it a chance to grow unhindered. If you are on the fence, you can read the first issue for free. Lucid Vol. 1 comes to stores tomorrow.